The new Audi A4's drive system sets new standards. The consumption levels have dropped by 11 percent on average, despite the increased power and torque of many of the engines. In the Sedan and the Avant each, Audi offers any of six TDI and four gasoline engines, with 23 possible engine-transmission combinations. All engines are supercharged direct-injection systems; the start-stop system and the recuperation system are standard throughout. The most economical variant in the model family is the Audi A4 2.0 TDI with 100 kW (136 hp). In the Sedan, this engine needs only 4.2 liters of fuel per 100 km (56.0 US mpg) on average - a CO2 equivalent of just 112 grams per km (180.25 g/mile). The new A4 2.0 TDI with 120 kW (163 hp), also optimized for maximum efficiency, manages with 4.4 liters of diesel per 100 km (53.46 US mpg). This equates to 115 grams CO2 per km (185.07 g/mile). Both engines are available for the Sedan and the Avant. In addition, three other four-cylinder diesel engines are available - with 88 kW (120 hp), 105 kW (143 hp) and 130 kW (177 hp). They can also be ordered for the allroad quattro, apart from the entry-level version. Three V6 TDI units complete the line. The 3.0 TDI with 150 kW (204 hp) (not for the allroad quattro) is the most efficient six-cylinder engine in its class worldwide; in the A4 Sedan it consumes an average of just 4.9 liters of fuel per 100 km (48.0 US mpg). The second variant, the 3.0 TDI, generates 180 kW (245 hp), with an especially clean diesel version. 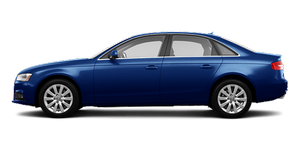 The Audi A4 series also presents the latest state of the art in gasoline engine technology. A new highlight of the TFSI family is the new 1.8-liter engine, available for the Sedan and the Avant. The four-cylinder engine delivers sporty thrust, with a power output of 125 kW (170 hp) and 320 Nm (236.02 lb-ft) of torque. The average consumption in the Audi A4 Sedan is limited to 5.6 liters per 100 km (42.0 US mpg), or 134 grams CO2 per km (215.65 g/mile). That is a decrease in consumption of 19 percent compared with the predecessor engine. The entry-level gasoline engine is the 1.8 TFSI with 88 kW (120 hp). The 2.0 TFSI - as the only spark-ignition engine also available in the Audi A4 allroad quattro - delivers 155 kW (211 hp). At the top of the line is the 3.0 TFSI in two variants. In the Audi A4 the V6, to follow a bit later, affords 200 kW (272 hp). In the sporty Audi S4 top model its power is an impressive 245 kW (333 hp).